At the end of last year, Damon Baker announced he would be leaving Nintendo after more than 12 years to pursue a new opportunity in 2019. He started out at the company in 2006 as the global manager of brand licensing and became head of third-party marketing and communications after three years, until taking up the head of partner management role in 2016. As can be seen, he even tagged Phil Spencer (@XboxP3), the head of Xbox. Spencer himself chimed in and said it was “great” to have Baker on board while welcoming him to the team. As sad as it is to see Damon leave Nintendo, it’s fantastic to know he’ll still be playing a big part within the video game industry. With any luck, this will further improve relations between Microsoft and Nintendo in this part of the world. 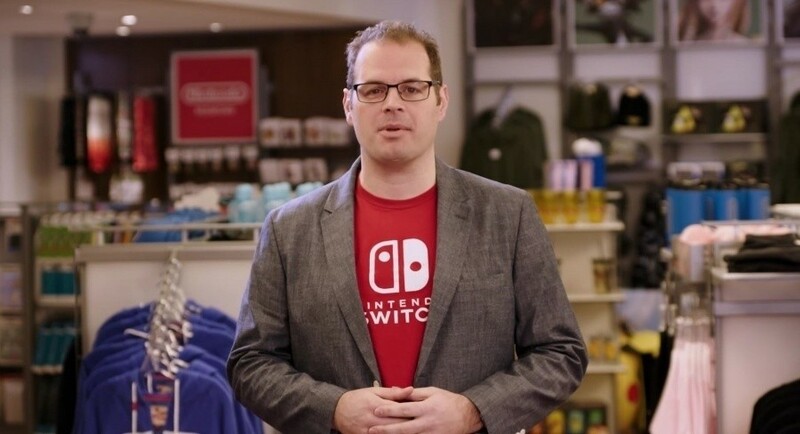 From the entire community here at Nintendo Life, we wish Damon the best of luck in his new position. Best of luck to him, even if some people consider him a traitor. Can't fault a guy for taking a better opportunity elsewhere. Still, I'm surprised there isn't more of a non-compete agreement in the games industry, as there is in say broadcast TV. Why is this even news? I agree. Well I wish the best for him, but I cannot say that with Nintendo as my major content provider, I don't feel a sting that he's now working for a company I disagree with. He must have been confused when he learned 3rd party content is a thing; "so how many parties are we throwing here?". I feel betrayed! How dare this man move on to a brighter, more opportunistic, personally fulfilling career! Console loyalty must trump all! In all seriousness, wishing Mr. Baker all the best in his new position! @LoriLoud He is. In Japanese culture it's very common for an employee to stay until retiring. In his case there was't reasonable reason for change, nor for the position assumed. I would make a 'traitor' joke, but if this is a better job opportunity for him, then I wish him the best of luck. It's Microsoft, so last time I checked it's cool. It's also across the road. Honestly, who cares? It's not like he's actively campaigning against Nintendo. He has merely changed employers. Hope he succedes in his new position. @mikegamer Gee, I wonder why. A higher up from Nintendo goes to a competitor and that's not a bit of news? @SmaMan Non-compete clauses are unenforceable in most situations once your contract has been terminated. I care. He was a face of indie gaming for Nintendo presentations, and it's nice to know how/where he is ending up. No one thinks it's a conspiracy or traitorous, but it's nice to see him land on his feet, so I appreciate the update. Hope that this brings closer Nintendo and Microsoft. Well, yes, but it's more a matter of keeping things in good graces with your previous employer, not burning the bridges as it were, not to mention your professional reputation. Wouldn't be surprised if NoJ was cramping his style.... just like they'd probably cramp Reggie's style big time. I've always had the impression that NoA are NoJ's puppets. "He’ll be helping evaluate all of the second and third-party content"
Well, doing that at Microsoft sure beats working with a bunch of Indies at Nintendo. Not to mention he is going from a company with 5,000 employees to one with 131,000 with fingers in just about every pie. Microsoft looks good on any resume - especially if he ever gets sick of gaming. jk Microsoft's huge, This is great for him! I can't fault the guy for wanting a change of pace and to take an opportunity when he sees it. I wish him the best! From head of indies to head of all third party games. @CharlieSmile Microsoft: you underestimate my (console's) power! I suppose my last comment could have been written better. My comment was intended to address that there is nothing wrong with him switching companies. I didn't mean to insult him or any of his followers. Curious who will be his replacement. People shift around all the time. Yuji Naka of Sega fame left to make his own company, then left again to join Square Enix. Great news, I hope he brings back the amazing "Summer of Arcade" level of indies to Xbox. That was what got me into indie games. He’s dead to me now. Good for him, hope he does well and enjoys his new job. I wonder if he’ll be put in charge of getting all the good indies to go with Microsoft. Wow! Second and third party content! that’s a new concept to Nintendo. Hope nothing but the best at Microsoft for him! He was not a key person in the team contacting third party like most of people think. Good luck to him in the new job but if the mainstream audience keep going the way it is right now, this change not was good. @Spoony_Tech Why does it matter? It doesn't affect us. Traitor.. how can he abandon us..
@mikegamer So if Reggie goes to Sony that doesn't somehow affect Nintendo? Theres reasons why companies have rules put into place in certain industries that you cant go to a competitor for a year if not longer. You can bet anything Damon knows about Nintendo's future plans Microsoft now knows. If this got us closer to having Master Chief in Smash, I'd be okay with that. @NickOfTime90 Lol, we dont need a man on the inside. Microsoft has said many times they want Banjo in Smash. For whatever reason Nintendo hasn't pulled that trigger. Yeah, but does he have a non-disclosure agreement with Nintendo??? @Spoony_Tech I know I was just messing around. Am I the only one wondering what the hell are 2nd party games? Is that what they call console exclusives on PlayStation and Xbox.. such as God of War and Halo? At least he gets to keep the free Nintendo Switch t-shirt. I know Sony and Microsoft would never give out free stuff to their employees like Nintendo does. They're always so cheerful when they first join Microsoft! @idrawrobots Most Xbox players I've met probably wouldn't even know what an indie game is so that'd be a pretty hard task. Phil Spencer is a huge Nintendo Switch fan. So I hope this move enables Xbox and Nintendo to do cool creative collaborations that benefit both great companies equally. Thank God this boring looking dude is gone!! Damn... Best of luck in the new role. - I appreciate his contributions at Nintendo. The past 12 years have been bomb-dilly-O-cious. Are people really that upset that they're calling him names now? And Japanese culture isn't perfect. Do they still have those high sucide rates do to the pressure of performance they require day to day or did those finally drop? Honest question. @Spoony_Tech Like this guy's going to MS is going to cause Nintendo to die off. Get a grip. Microsoft will definitely try to buy Nintendo again at some point. They're playing the long game. @ddowler85 More likely Apple who will try. Apple just doesn't seem to take gaming seriously, and they're not making much progress in pushing their platforms in homes. I think Apple's best days are behind them, honestly. MS, I don't think so. Adding Nintendo's IP to the XBOX would be a disaster for both. @Rohanrocks88 Rareware was a second party under Nintendo. Now MONOLITHSOFT and Pokemon are. Basically a company that is majority owned. @Spoony_Tech where did they say that? Funny xbox is dead last in sales and he going there that just makes it look the more desperate. I think he signed some clause that wasn't to his advantage. @retro_player_22 not true. Microsoft gave all their employees a free Zune and a free Surface RT. @StuTwo My cousin who work there never got one though. MS putting massive effort into talent acquisition and showing just how determined they are to make this gaming thing work. X1X is already an amazing console and the plans for next gen already appear to have Sony trying to make sure they can keep up. I think it's an exciting time to be in the MS camp. i hope Microsoft and Nintendo will work together at some point. I love both consoles. Looks like MS are giving the next console a good go. Good studio acquisitions and they're doing some really great stuff with Gamepass. @LordGeovanni what the hell ? That you disagree with what did they do to you ? Right choice....now he can jump into the spotlight at Microsoft. Nintendo has too many talents, some talents just doesn't get the spotlight they deserve sometimes. Why can't people just wish the man luck and move on ? Good luck to him I hope he does well at Microsoft and brings some good 3rd party support Xbox. Imagine if one day we could enjoy gaming without the unrelenting drone of fanboys. What a day that would be. He really did wonders for Nintendo, and I'm sure they will love a guy like him at Microsoft. That guy: I work at Xbox now. Nintendo: knock knock Can...can...can Master Chief come play outside? We're playing Smash. @Trajan It was tweeted by Phil Spencer at least once and that was back when the Wii U version was being made. I believe hes tweeted jt more then once. Best of luck to Damon. Now can we play as Banjo and Kazooie in Smash? Good for him! Maybe he can work his magic to get a Rare or Microsoft character in the game now? Please? Please can we have Rare Replay on Switch now. Congrats to him - and all the best. But it's got nothing to do with me, so... I don't really care. @mikegamer because an high ranking and customer facing employee from one game console maker left one company for a competing game console company. @Majora101 Hear, Hear! Maybe he can talk to them about hoarding Killer Instinct from the rest of the world. I bet he likes Pepsi. Let's hope he brings all the shovelware from the Switch to the Xbox. Put an ex Nintendo guy in charge of second and third-party content.. Don't look like the smartest move in my book! It does look good, but it doesn’t come without risk. Companies like MS are known to roll heads to save face at the drop of a hat. And sometimes you may have done nothing wrong, but for publicity’s sake (even internally), that position needs turnover and fresh blood. Not that I think that will happen to him but... ya. My mom works for GE Healthcare in Milwaukee, and you’d be shocked to hear the rate of turnover within that company. And it’s not the low paying jobs that get burned. It’s the guys at the middle and top. @JaxonH yeah... Sometimes even just to satisfy investers. "Fresh blood" as a smoke screen that the company has a new bold direction. My brother has survived like 3 rounds of "realignments" at his corporate job. Some of his bosses not been as lucky.